Now you might be very organized and have the iChat window in a certain spot on the screen or even on a certain space in Spaces. You might be a whiz with Exposé and immediately find the right iChat window in the myriad of windows that are open. Or you might have one or two 27″ displays and not really care about this. But for the rest us, wouldn’t it be nice if say a small window floated into the screen with a notification and the person who sent the message and maybe even the message? And it would have to be unobtrusive and float away just as quickly. You could glance at the notification and decide there and then wether it is necessary to dig out that iChat window. Incidentally, this is what Growl really does well. This window will float serenely in front of everything for a few seconds. I also setup the script to react to “Buddy Becomes Available,” “Buddy Becomes Unavailable” and “File Transfer Completed.” The great thing is that you don’t have to enable all notifications. You can even set it up individually so that you get notifications for some buddies, but not others. It should be easy to adapt the script to more actions if you wanted to. Works like a charm! I’ve been missing the Growl notifications that Chax provided in Lion. This hint is an awesome replacement. Thanks! This is a super helpful hint, now that Chax no longer works with Lion. Thank you a ton for this! Do you think there is any way to tell Growl to show the buddy’s avatar in the notification, rather than the iChat logo? Thanks! Nevermind my previous comment, I didn’t realize that this functionality is already happening. Awesome! thanks for your script, it was very useful when I switched to Lion. Total AppleScript noob here. Is there a way to tweak this so that the notification only happens if iChat is in the background? It appears that the way it works now sends notifications even if iChat (and it’s chat window) is the active application/window. Thanks! Worked like a charm!! oh, thank you, man! you saved my life!! 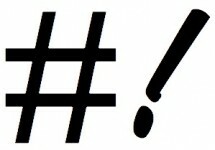 Looked forever for this functionality on OS X Lion. Someone on Twitter pointed me to the site. My joy cannot be contained, as I did not want to switch to AdiumX. iChat has pretty decent audio, video and screen sharing, which I use all the time. Seriously, this is great stuff…the lack of growl in iChat has been driving me crazy since I upgraded to Lion and chax stopped working. The only thing that would make this better is if you could bring iChat to the front when you click on the growl notification, but I can live without that. This is great – any way to make it not activate when iChat is the active application though? Do you know how to add this?? Hey, this is great! Do you mind if this gets distributed by other people? 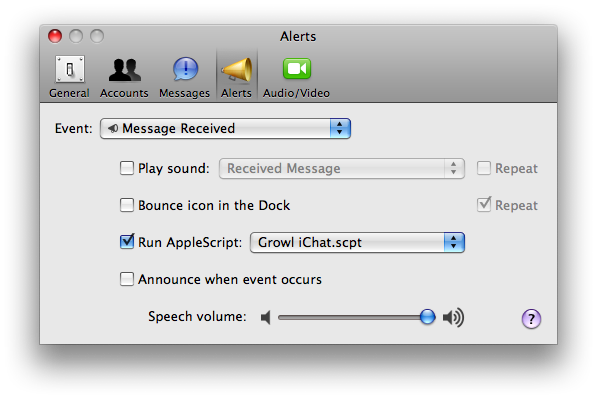 Also, can you think of an easy way for the script not to growl if iChat has the focus? Thanks a lot for this post. Even if it’s rather old it is functioning quite good under lion too. I’ve tried to install chax, but this runs not under lion. Now my problem is solved in a very simple and elegant way. “An error occurred while executing an AppleScript event handler. Excellent and just what I was looking for. Great script man I for one had to post and say how useful it is to finally have iChat notifications via Growl. Again thanks a lot for the script.